Playwright Series with Toni Henson of The Atlanta Black Theatre Festival In this episode of the playwright series, I interviewed Toni Henson, an award winning producer of the Atlanta Black Theatre Festival, which is in currently in its fifth year of operation. The festival provides a platform for artists to bring their work to their stage. 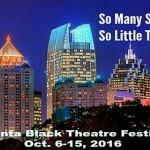 Persons from all over the world travel to perform at the Atlanta Black Theatre Festival..